The value of virtual reality rises and falls in line with the content that is available. ATP’s new BIM app offers interested observers a glimpse into the progressive design approach of today and tomorrow. ATP architects engineers have been using the state-of-the-art design method BIM (Building Information Modelling) in all its offices since 2012, always in combination with the integrated design that it has been practicing for 40 years. In 2015 the standards used by ATP were drawn upon during the definition of the first Ö Norm for the regulation of the BIM process. The ATP app offers users an entertaining and interactive way of gaining a better understanding of the complex relationships between integrated design and BIM. And it is particularly instructive for younger people who are interested in architecture and engineering and are currently studying or have already studied such subjects. The free app is available from both the Playstore (Android) and the AppStore (Apple) – simply enter “ATP BIM” into the search function and download the app onto your mobile device. 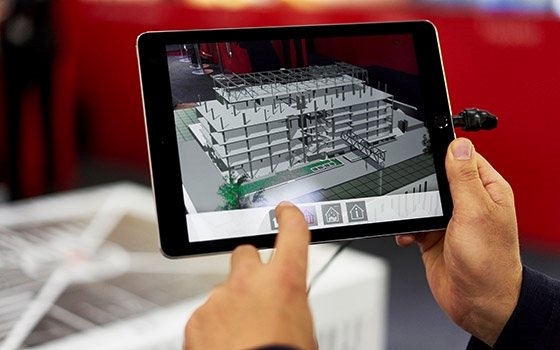 Augmented reality with 3D makes the experience possible. BIM enables users to spatially visualize the integrated design of architecture and structural and services engineering in a single data model. This offers stakeholders both simultaneous access to all data and the ability to exchange their knowledge during the entire lifecycle of a building. However, this also means that only integrated design processes are able to make optimal use of the advantages of BIM. The plausibility of parameters can be checked in the earliest design phase – which is a guarantor of higher built quality. Hence, BIM offers a completely new quality of interdisciplinary cooperation. Due to its capacity to offer precise estimates of construction and operating costs, the use of BIM is already obligatory in many neighbouring countries. For many users, however, BIM in combination with integrated design remains the main subject facing the future of the construction sector. ATP’s app brings this subject a little more to life.